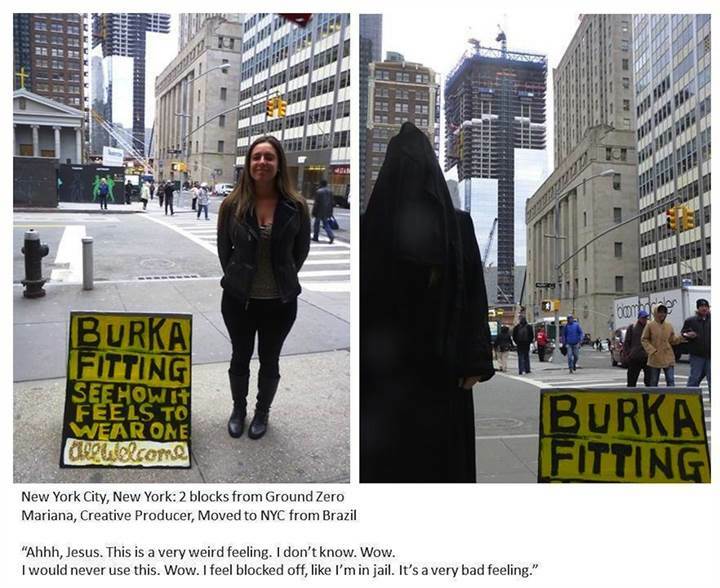 Burka Fittings invites people on the street to experience how it feels to wear and see themselves in the burka. Burka Fittings Across America is a social art project that invites random people in public spaces to experience how it feels to wear and see themselves in the burka. The project explores otherness, embodiment, empathy, and the meanings Americans associate with the burka -- a garment that consistently triggers gut level alarm in participants. I am collaborating with social scientists to explore these visceral reactions. Can education shift the bodily sensation of alarm? If so, how, and to what end? To date, over 100 people in 18 states have participated in the Burka Fittings. Their reactions are documented with video flip cameras and photography. The project is scheduled to continue throughout all 50 United States. An additional phase of the project will explore how the burka is perceived abroad.